Whether we're sparring or in the midst of a dangerous altercation, our training is designed to facilitate our ability to respond immediately and effectively to any kind of attack. As if a blueprint were being enacted, spontaneity should flow from us unimpeded with effortless ease. The problem arises when we try to anticipate what our adversary might do. The solution in part is to arrive at a placid state of ambivalence. Given the unpredictable nature of a fight, achieving this frame of mind can indeed be difficult. How do we prepare for this? Meditation is commonly defined as the practice of stilling the mind. To be precise, the means and end of meditation is to become fully aware of ourselves, especially our thoughts. Ordinary cognitive thinking does interfere with our ability to become one with a task. The last thing we want to do is to start mulling over the "what ifs" during a moment of crisis. One of the roles of forms (kata) practice is to provide us with a moving meditation of sorts. Anyone who has had to test for kata in front of a high ranking board or go out to compete at a large tournament can appreciate how daunting it can be to "become" the form sans the interference of self-consciousness. This is referred to as mushin no shin - the mind of no-mind - a realm where the practitioner merges with her/his art. Although kata can never approximate the chaotic uncertainty of a real fight, it does provide us with the tools to attain not only a level of technical proficiency, but also a negation of the self. The most common method of meditation in the martial arts is called mokuso where the practitioner sits, usually at the end of a training session, to develop presence of mind. 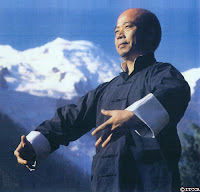 In certain schools of Chinese boxing such as yiquan and tai chi, standing meditation is practiced. Though simple sounding enough, the standing practice is reputed to be quite arduous, particularly for novices. In many schools, formal meditation is rarely seen at all. Most instructors regard its practice as either unnecessary or obsolete. I've been meditating for almost as long as I've been practicing karate, and I find it to be a valuable resource for both training and daily living. In his Classical Budo, Draeger writes, "Meditation gives a chance for the vital 'loosening' of one's inner powers. It is a practice that builds hara, that patient, calm, and undisturbed coolness of mind essential to classical disciplines." Some confuse no mind as something that means to not think at all, however this might be true for those who think too much but then not exactly. Bruce said that no mind really means the immovable mind, to be fluid and continuously changing and adapting. The mind is there but not sitting at one place as our awareness easily becomes stuck, it moves everywhere and we should not cling on to it. I think that mindset comes from Zen meditation. No mindness is also a means to free your mind of distractions, unnecessary thoughts and emotion so that it can remain clear and focused. I find that my little efforts to attempt to perform Mokuso before and after class has helped me learn to focus, and quiet my mind. I realize that I have quite a long way to go to be able to achieve what I desire, but each attempt brings me closer to my goal. Meditation is commonly defined as the practice of stilling the mind. I would also like to add that the practice of meditation also has a considerable positive effect on our physical and mental health. Although kata can never approximate the chaotic uncertainty of a real fight, it does provide us with the tools to attain not only a level of technical proficiency, but also a negation of the self. Kata is a way to program the body and mind so when in a conflict the body moves and reacts before the mind has a chance to cause a problem. When you couple this with proper mushin and zanshin practice as well as mokuso you have the best conditioning possible with out actual combat experience. The most common method of meditation in the martial arts is called mokuso where the practitioner sits, usually at the end of a training session, to develop presence of mind. In a lot of so called traditional schools this seiza mokuso type practice is at the beginning and end of training for the purpose of; at the beginning to clear the mind of all the day's trials and tribulations so the mind is focused on training in karate; at the end of the class to reflect on practice and our lives in karate and to give our deepest thanks to the way and those who brought it to us. In many schools, formal meditation is rarely seen at all. I find this in the so called Mac-dojo or those strictly for supo-tsu karate. Most instructors regard its practice as either unnecessary or obsolete. Their loss, especially as they age they will find its benefits a life extender. I've been meditating for almost as long as I've been practicing karate, and I find it to be a valuable resource for both training and daily living. I have been doing it as well in my practice and also as a Dragon's Gate Taoist practitioner. We don't meditate as a specific part of our training. I don't know for sure, but I don't think it's common within BJJ schools. I know many BJJ students who practice yoga and would not be surprised if many also practice some sort of meditation. I remember when I first began the standing practice. I wanted to jump out of my skin after about 5 minutes. Our class begins and ends with 1 minute of meditation. In the beginning, this allows us to clear the mind of all the worries of the day. In the end, this allows us to go with the flow of the things we learned in the class (without holding on to a certain idea) and to lower our adrenaline. I see no mind not as not thinking but more as not holding on to particular thought. That's likely a popular misconception. Even harder to grasp is being able to "not think" while somebody is trying to cut your head off! Of course we need to maintain bare attention, which is key in the martial arts and Zen. Little efforts. They all add up. Some say you should sit for an hour a day, but there are benefits to be reaped from even 1-5 minutes of meditation. I have been doing (meditation) as well in my practice and also as a Dragon's Gate Taoist practitioner. I'm not familiar with that particular lineage. Actually, Taoism isn't exactly my forte right now, but in November I'll be attending the lecture of a very popular speaker on Eastern thought who supposedly has his own interpretation of the Tao Te Ching that promises to be very interesting. Some systems seem to favor meditation more than others. All you really want to do is just clear out your mind, especially if you're involved in a style that focuses on plenty of free-style randori. What I like to do right before a match (or any other kind of performance) is just take a long deep breath. It's not formal mokuso, but it has a similar effect. It works pretty well for me. I could imagine. When I get up the nerve to try out zhan zhuang I'll let you know. Right - when we meditate, we just want to let the thoughts come and go. Just witness the thought, as opposed to identify with it. John, I'll try that. I do often find myself closing my eyes while I'm rolling. While not strictly a form of meditation, I feel that it grounds me and allows me to sense a lot of things I would otherwise miss, such as weight distribution, hip movement and a sense of the flow of the match. A technique to help stilling the mind is to frame ideas. Meaning you have something completely occupying your thoughts, imagine it in a frame and put the frame aside. Then focusing on breathing. Repeat. Works wonders for me. Moving meditation can probably happen at sandan more naturally. Or after long long long hours of practice. I remember a long 8h practice session spent mostly on 4 katas where well, gross motor skill was doing most of the work at the end. Muscle fatigue is great to stilling the mind too. Am I the only one that can't go to sleep after a class? I need at least 2 hours after it. As for the rest, well Ego is definitely tough to "overcome" or be one with. Life goal. We never did meditation in our classes. I'm not sure I'd be very good at it. I don't know how people keep their mind from wandering. I'm not ADD or anything but I feel like it if I try to meditate. I'm usually pretty wired after a hard training session myself. The same with work; no matter what time I get home, I still need time to unwind. Meditation at first is challenging for just about everyone for exactly the reasons you said. It's something that feels uncomfortable and even strange at first, but you get used to it. I highly recommend it. You may be surprised at how good you get at it after a while, along with some very noticeable benefits. About sleep: when I'm practicing the standing exercise regularly, I find that I fall asleep as soon as my head hits the pillow. About keeping the mind from wandering: You don't really "try" to do anything. You let your mind settle; you relax. After some time, your "monkey mind" will settle down. I think of Martial Arts as a kind of moving meditation - it makes sense to me to have a moment of stillness afterwards so I generally meditate after training. I find training enhances meditation and vice versa. I find training enhances meditation and vice versa. Same with me. I suppose it's an aspect of yin balancing yang.